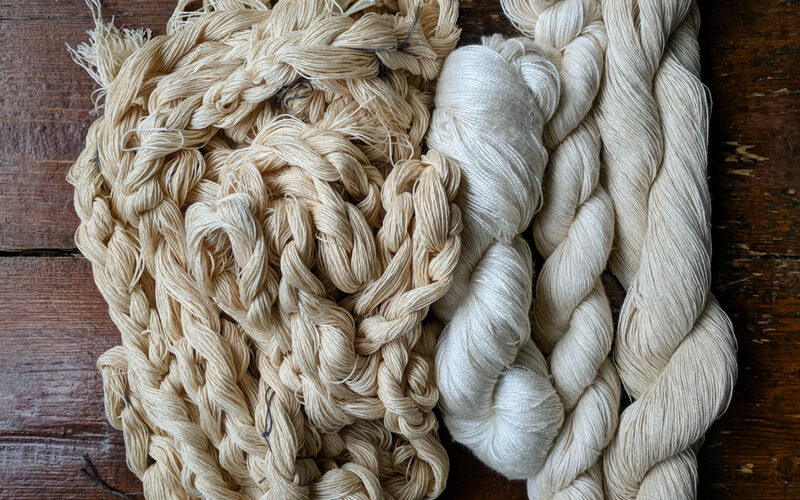 If you’ve looked through the shop, you know that we focus specifically on undyed yarn for weavers, knitters, and dye artists. There’s a reason for that. I’m a weaver, knitter, and dye artist and dye all my own yarn. You might already be here because you’re interested in dyeing yarn, but you also may be new to dyeing yarn for weaving. Even for experienced weavers who are new dyers, dyeing an entire warp can be daunting. I’m often asked where to even begin. So I wanted to boil down the two most frequent arpproaches to dyeing a warp. I know this is dense but I hope it gives a good amount of context and experience that will be helpful! But first, why dye your own warps? Some great reasons include much greater control over your colours, achieving softer colour variations and tonals rather than stock solids, clouds of colour rather than pinstriping (when using method #2), and you have access to a much wider variety of yarns, which could never come in any useful range of stock colours. Also though, I think that it can work out to be much more economical in the long run, as you don’t need to keep a million different colours of yarn in stock, and you can use minimal cones/spools/balls to get the amount of warp you want, without bits of colour left over or having to buy an entire cone of a particular colour if you don’t need it. You only need to have one colour on hand – natural. Back to the topic! This isn’t a dyeing tutorial and it assumes that you know how to warp your loom and weave your piece. This is how to approach getting from a cone of blank yarn to a colourful warp, and some considerations to bear in mind. Now, here are the two most popular ways to dye a warp. How to choose between them? It all depends on how you want it to look. For the most part, these apply whether you are doing fibre reactive dyeing in soda ash/base, like you would for cellulose fibres like Supima cotton, Tencel, SeaCell, or even silks (which can be dyed in either method), or acid dyeing for protein fibres like blends with wool and silks. Method: using a skein winder, swift, or a DIY item like the back of a chair, two people’s hands, pegs, etc., to make a skein of yarn. Secure with figure 8 ties but don’t do them too tight or they become dye resists and the yarn under the tie will be undyed. The number of ties is up to you and depends partly on your size of skein, and I’ve heard of everything from 1 to 8 ties! I use 3 usually plus where I’ve secured the ends, which I also do in a figure 8. You can also do more than a figure 8 if you wish – feed the yarn through another loop. Then dye – immersion dyeing for solids and semi solids, or handpainting for variegated and tonal and beyond! Ball up, and warp as you usually would from spools of stock colour, according to your design and preferred process. Effect: If dyed as solids, pinstriping or solid colour as with stock dyed yarn. Handpainting allows for for more variegation and subtle shifts in colour. Considerations: Tangles are usually non-existent if you’ve made tidy skeins and used plenty of ties. If you want to avoid the pinstriping of a variegated stock dyed warp factor that into your design and make sure you blend very, very well when warping to get smooth transition. Equipment might be an issue – converting all this yarn to skeins and then balls if you don’t have suitable equipment or you’re doing a long warp may be time consuming. Your colour control is limited to the width of the warp, but down the length of it will be fairly consistent. Benefits: Tonal, pinstriped gradients, can finely control colour and gradient/accents across the warp on a thread by thread level. This is also particularly manageable for people with limited space, as you really only need a countertop the size of your skeins! Method: using the method you normally would to make warp chains, whether that is a warping board, mill, reel, Warping Square, Warping Wheel, or another method, to make the warp chains you need. If you’re warping sectionally you can make your chains the right size for each of your sections. For example, I warp in 2 inch sections, so if I were to want 24 epi I would do chains of 48 ends, to the warp length required. Chain up, and begin the dye process with your soaks. To dye you lay out your soaked chains on your dye surface. You can either dye chained up, or unchained. Unchained will give you more precise control over placement and chained will allow for more random and spontaneous placement, as a very broad generalisation. Like anything, try it out and find out what works best for you! If cellulose/soda ash dyeing, cover up and leave to batch. If protein/acid dyeing, you can roll up in some form of sheeting and heat according to your dye method. You can also vat/immersion dye these and I would really recommend you give all of these a go to explore different methods! Once your chains are dyed and dried, you can either beam as you would onto a plain beam, or feed through a tension box onto a sectional beam. Some people even put the chains back onto their Warping Square or Warping Wheel and beam as usual from there. It is worth considering keeping the cross of the warp chain, but depends on your method and preferences. Effect: The possible effects vary by your method and process! It is possible to have distinct stripes across the warp if each chain is dyed separately. This can produce a fantastic effect of bold stripes of dyed sections. You can also dye in a gradient. You can also dye along the length of the warp as well as across to get the effect of ‘clouds’ of colour. This can create a soft, watercolour effect. All of this is also affected by how you blend in your warping and threading and I would really recommend blending heavily in your threading if you want to avoid blocks. If you want to preserve the sections, carefully keep each chain separate in the threading. Considerations: This can be a very space hungry method! If you have limited space this may be challenging, but immersion dyeing or low immersion dyeing is still worh a shot. Another thing to consider is that you are making the entire warp in one go – you can’t just add another bit to get it longer later, like you could if you were dyeing skeins. I’ve learned that the hard way! Also bear in mind that broken warp ends are a reality of weaving and if you don’t have spare ends dyed you’ll be in trouble. Always dye some extra, even if that is in another method, to blend in and have on hand in the case of breaks. The biggest thing with this is that you do not have thread by thread colour control. Your control across the width of the warp is much broader, with less detail. Benefits: Colour control along the length of the warp is huge here. You can have only areas, or clouds as I call them, of colour, or dye on a larger scale, it’s really up to you. You can have effects that start and stop for different patches. There are so many possibilities. Many people also find it faster to just make natural (“natty”) warp chains rather than creating precise chains from either dyed skeins or stock dyed spools. I hope this is useful! With dyeing the possibilities really are nearly endless and these are just two ways to get you started! If you found this helpful please feel free to share on Facebook, Instagram, Ravelry, or wherever you like.